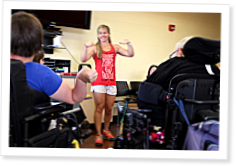 Anna Woods describes workouts that showcase the creativity needed to provide functional movement skills to clients with challenges including cerebral palsy, Down syndrome and paraplegia. CrossFit for people with developmental disabilities involves adapting movements for mental and physical delays while nurturing and growing a culture that encourages improved function for day-to-day life. I usually have to adapt things such as the complexity of the movements, the length of time it takes to do the exercises, the arrangement of the class and the order in which we do the movements. The movements I choose are key to working with my clients. When considering a class template, I plan exercises I know will fit the culture of the group in personal ways. I’ll use Cupid Shuffle and Michael Jackson dance moves and pair the movements up with workout cues that involve familiar day-to-day movements, such as cleaning the kitchen. On top of the movements themselves, even class structure often looks different for my clients than it does in most traditional CrossFit boxes. I have learned to keep my classes relatively short. They last about 30 to 40 minutes; many lose focus after that, and others simply do not have the endurance to exercise longer. In addition, most clients with developmental delays learn through experience, so repetition is key to proper movement patterns, which is why I do the same warm-up and cool-down exercises for most classes, and why we often do the same workout several times in a month. Despite the challenges, programming for this group of individuals can be very effective, but it requires a large amount of flexibility, creative thinking and patience. Such a fantastic mission you've accepted, Anna. Thank you for what you do. I was cheering at my desk. And I'm going to find out who was cutting onions in the office if it's the last thing I do. I lost your number! another great article! keep up the great work!